Everest Base Camp Helicopter tour lets you to enjoy the wild vicinity of the entire Everest region with landing at Kalapathar or at the Everest Base Camp. Everest Base Camp Helicopter landing tour is different type of tour by riding a helicopter to explore the Himalayas in short period of time. This is obviously an exciting helicopter flight in the Everest. Mount Everest (8848meters) is the highest peak in the world. It is the dream destination for many people to see and explore live. Even some people have high desire to see but not comfortable by walking to the entire trekking route, this Everest heli tour is the best option for them too. The helicopter tour to Everest gives aerial view of the massive Mount Everest and other several peaks to gain adrenaline and adventures experience. Everest Base Camp Helicopter Tour gives an excellent addition to the entire tour package of individuals in Nepal. This heli tour begins from the capital city of Nepal i.e. Kathmandu and later on, you have to fly eastward towards the beautiful village consisting of Sherpa people and gateway to the Mount Everest in Lukla. The helicopter flight from Lukla thus moves ahead to Syangboche, Dingboche, Gorakshep and Khumbu mountain glacier to reach at the top of Kalapathar from where you can see the Mt Everest very close. Everest Base Camp Helicopter tour lets you to get the magnificent Everest view and pool of opportunities to view iconic landmarks in Nepal. In fact, the tour gives a few of the best views and sceneries of the Himalayan Mountains. You will get maximum 5 minutes associated with landing time at the Kalapathar (5545m) because of high altitude. Moreover, trekkers will get 20 to 30 minute time at Syangboche to have breakfast and tea/coffee. Syangboche gives panoramic views of the Mount Everest and its entire range. Finally, helicopter fly back to Kathmandu. The tour starts in the East direction from Kathmandu, the capital city of Nepal. The helicopter flight passes through many high mountains and hills of the Nagarkot by crossing the nearby Sunkoshi River. During your flight, you will be able to view many villages located in mid hills and a large number of farming lands. Particularly, you may get views of a few common things i.e. blue rivers and green hills, while travel very close to the Rolwaling and Gaurishankar mountain ranges in the Himalayan region just above the Jiri Bazaar and Charikot of Dolakha. Later on, you will cross the Lamjura Pass to enter the Everest region. Our helicopter will land at Lukla to obtain necessary fueling and after only 5 to 10 minutes period, you may fly over Dudhkoshi River to reach Namche Bazaar, known as the capital of Sherpa people. The flight again lands at the hilltop of Syangboche and finally, you may fly to the Everest Base Camp. During the entire tour, you will find major high mountain peaks, which are Kangtega, Kusum, Thameserkhu, Kangaru, Lhotse, Amadablam, Pumori, Nuptse, Island Peak, Pumori, Lobuche, Mera Peak and many more. Finally, the tour lets you to view deep mountain rivers, clear lakes and white hills. 01: How high does the Everest base camp (EBC) helicopter trip fly? Starting from 2,000 meters, we will fly towards 5,500 meters high or sometimes more in some areas. 02: Does it land at the Mount Everest Base Camp or Summit? It lands on Everest Base Camp, not at the summit and also lands on Kalapathar view point for very short duration (approx. 10-15 minutes). The landing may also be affected by the weather condition as well as perfect landing areas. Sometimes avalanches, wind and rock falls may obstruct the landing spot. We will try our best to fulfill our promise from our side. 03: How many hours can helicopter stay at Everest base camp / Kalapathar? It’s too cold in the Everest Base Camp and Kalapathtahr and longtime landing on extremely cold area may lead to Helicopters engine off. So, to avoid such unwanted problems, we will land for very short duration (enough time to explore Khumbu glaciers and Icefalls and capture them in your camera). 04: Do we have enough time at Everest base camp? Yes, you will get 10-20 minutes in Everest Base Camp which is quite enough time for you to enjoy the beautiful sight and scenery of rugged mountains and glaciers. Due to high altitude threat longer time is not recommended. 05: Who leads the trip and are they well trained and experienced? Without any doubt, all our pilots and guides are well trained with an experience of more than decade in this line. Our tour leaders has experience of leading the tourists from all around the globe and showing the Himalayan wonders with full knowledge of flora-fauna, local cultures, lifestyles and are very helpful. They are always ready for your help in any kind of Emergency and well equipped to call for helicopter in case of serious emergency for Helicopter evacuation. 06: How are the meals in Tea-house and Lodge on Everest region? As Everest Region is worldwide famous trekking trail, you can expect great hospitality with multicuisine in the lodges and Tea huses in this trail. All the guest house and lodges offers hygenic foods. If we won’t get enough time to land and visit Tea houses, we carry packed hygenic lunch to save time during the flight to Everest Base Camp. 07: How are the arrangements for safe drinking water on this trip? On Everest Base Camp Helicopter Tour, we will carry boiled and cooled water for 100 % purity. As the purifying tablets doesn’t works best in the hard water of Himalaya containing high amount of minerals like manganese-bi-carbonate and iron. You can also buy a bottled water but it is expensive and not good from Eco-tourism perspective as the plastic bottles makes wastes in Himalayas. 08: Do you offer Money Worth and Best Value Trips without Any Hidden / Extra Cost? Yes, we offer you money worth and best value trip without any hidden cost. However each company has its own policy of dealing with worldwide costumers regarding price cost of the trip but more people in a group will be beneficial to both costumers and company. In Everest Helicopter Tour maximum 4 peoples can join as one group, this will reduce the chartered helicopter cost and lodging/fooding costs, too. 09: How do I book Mount Everest helicopter tour with your company? 10: I am a solo traveler, can I join a group for Mount Everest helicopter tour? Or helicopter day tour of Everest (stopping at the base camp)? Yes, send us an email with your preferred flight date which will help us to join you in a group and share your cost of EBC Heli Tour. 11: Can you take a helicopter to Everest base camp? Or helicopter day trip to Everest from Kathmandu? Yes, we are always ready to take you to Mount Everest Base Camp in Helicopter. You can contact us for the best excursion to Everest in a Helicopter. 12: Can I/we Fly to Everest base camp by helicopter in the morning and take our international flight after 1 PM? Yes, EBC Heli flight finishes by noon then you can take international flight after 2PM. 13: How far is the Kathmandu International and Domestic Airport? Its only 10-15 minutes walking or 2-4 minutes’ drive from Kathmandu International Airport to Domestic Airport. 14: How much does it cost to fly to the Mount Everest base camp by Helicopter? It depends on your group size, group with 4 members will help to reduce your cost. Normally it starts from 900 U.S. dollars. 15: Can we picked up from Everest Base camp to Lukla by helicopter? Yes, we pick you up from Everest Base Camp or Kalapaththar or any other places in Khumbu Region like Gokyo Lake and Gorakshep etc. and drop you to Lukla or Kathmandu as your wish. 16: Do you arrange rescue service by co-coordinating with our insurance company? Yes, we can communicate to your insurance company and arrange rescue if any emergency occurs. We also provide air ambulance service and chartered helicopter service to Everest Base Camp. 17. Do you carry oxygen tanks in case of emergency? 18. Is there any helicopter ride to Everest base camp and summit, landing on the ground of the peak? Our helicopter flies over Khumbu glacier, the largest glacier of the region and lands in Everest Base Camp. Kalapaththar is the highest point where our helicopter lands and no any helicopter lands on summit of Everest for commercial purpose. During emergency, we can land on the various parts of the Everest for rescuing. 19. Can we / I charter a private helicopter tour to base camp of Mount Everest? Yes, you can charter a helicopter tour to Everest Base Camp. Contact us for reasonable price and guaranteed service with experienced pilot and guides. For lower cost please join a group of maximum 5 peoples. 20. Does weather affect the helicopter flight to Mount Everest Base camp? The weather in Everest Region is unpredictable, so we call the local peoples for live update and start our trip. The early morning flights are more pleasant. 21. Can anyone trek to Everest base camp and return by Helicopter either from Kalapathar or base camp or Gorekshep or Lobuche or Pheriche? Yes, we can pick you up from Grakshep, Lobuche pr Pherinche. 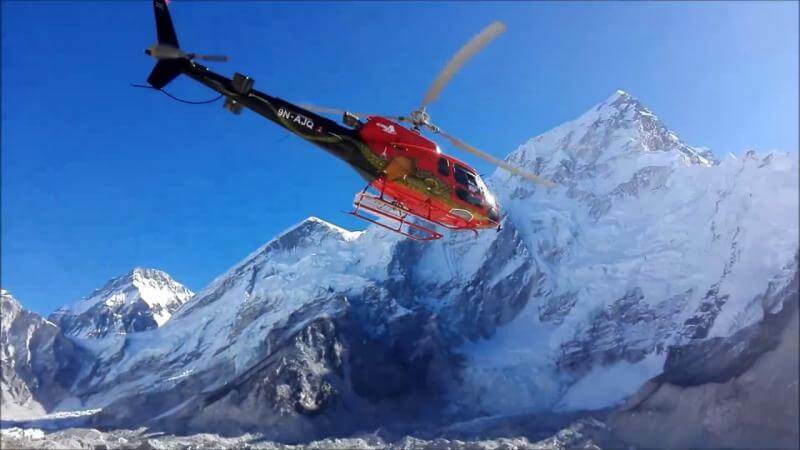 Contact us if you need any Helicopter service in Everest Region. 22. Is it possible to take helicopter flight from Lukla or Namche to Everest base camp or vice versa? 23. What happens if there is bad wind? If bad wind- safety first so can’t land at Kalapathar Everest base camp if the wind is worse. Thank you for your understanding and co-operation. This trip was a very last minute decision on our part, but Nepal Helicopters team were very quick to respond and accommodated our requests. Everything was simple and efficient. We recently done the Everest helicopter tour organized by Nepal Helicopters. We had a good communication and was with us in every step of the way from initial planning to finish of the tour.